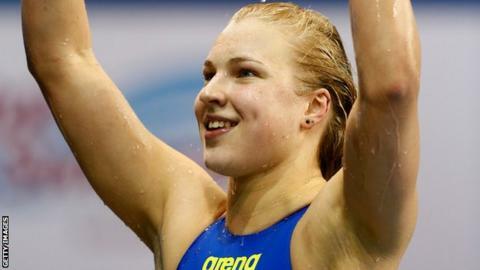 Olympic breaststroke champion Ruta Meilutyte can return to the form which saw her become the best in the world, according to her coach. Jon Rudd says the Plymouth-based Lithuanian has recovered well after breaking her elbow in a cycle accident. The 18-year-old will have surgery on Tuesday to remove a plate that was inserted in her arm after the crash. "The times that she's been doing in training have been first class," Rudd told BBC South West. Meilutyte burst onto the scene at London 2012, winning 100m breaststroke gold at the age of 15 before going on to claim World Championship gold the following year. She took silver at the 2015 World Championships in Kazan and is the world record holder at 50m and 100m breaststroke. The plate that was inserted in her arm in September has been rubbing on her tendon and the operation to remove it will see her out of the water for up to two and a half weeks. "I'm really looking forward to January and February once she's right back to where she needs to be and we can do everything we need to do without her having any discomfort," added Rudd. "There's no doubt in my mind that Ruta can be as good as she was, not just in London, but as good as she was in Barcelona when she broke the world record. "That's what we're looking for, getting back to being on top of the world. We want to be looking for another world record, that's for sure." Is it now or never for Wenger? Read more on Arsenal: Is it now or never for Arsene Wenger to win title?